This recipe was requested by my husband, El Cubano, for Father’s Day. For sure, you are thinking that it is too late now, let me tell you it is not! 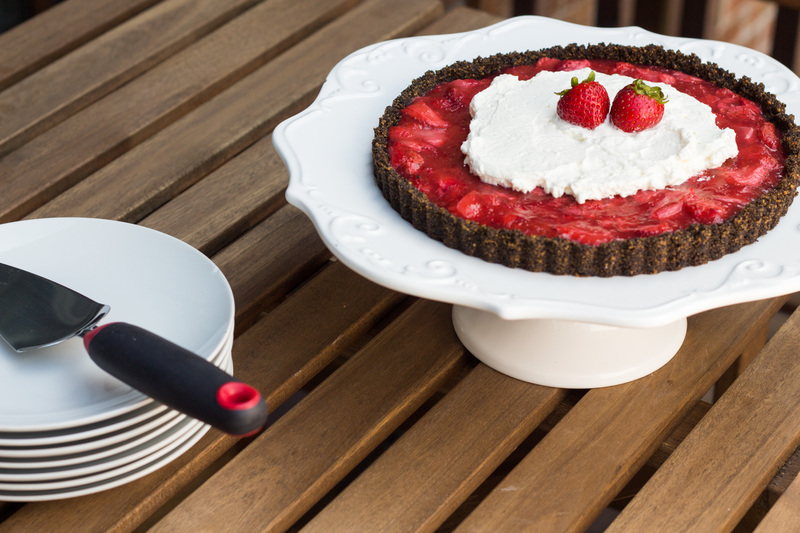 You don’t need an excuse to be using some fresh strawberries and that buttery Oreo crust. It is all you need right now… and a fork to eat it! This can be eaten today, tomorrow, birthday, anniversaries, you name it! It is fresh, it has been chilled, it has an amazing chocolatey-buttery crust. The not-too-sweet whipped cream is just the light topping that you’ll enjoy. This is THE recipe that you need to have on your table to end a summer meal. The strawberries are in season, go get ’em and taste those flavorful and juicy fruits. This recipe is not totally from me, I don’t want to take all the credit, that would not be fair at all! I found it in a Québécois magazine Coup de Pouce. I took a good chunk of inspiration but made some twists. They call for Graham crackers crumbs. Shall I justify my change for Oreo? Don’t need to eh? That is what I thought. I added vanilla a little more here and there. I prepared the strawberry filling a little differently too. But still, go ahead and have a look at this nice magazine, my monthly treat in the mail. Unfortunately, no picture of an individual slice, I could have taken pictures of the crumbs in the plate… It speaks for itself, doesn’t it? - Melt the butter: In a bowl, put the crumbs, the salt, the vanilla extract and pour the butter: Stir until well mixed. 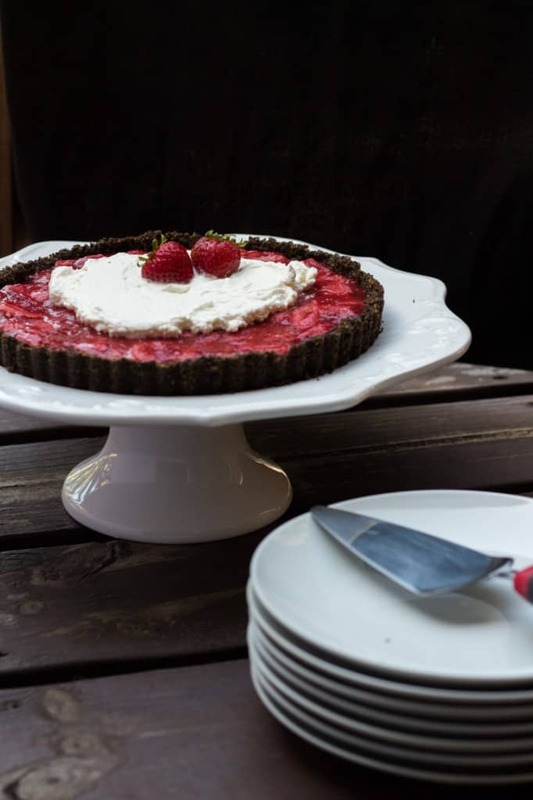 - In a 9'' baking dish (like a cheesecake dish is great), press down the crumb mix evenly. - Bake 8 minutes at 350F. Allow to cool down and set aside. - In a pan, put all the strawberries roughly cut in 4 and the water. Bring to a boil for 2 minutes. Mash the strawberries a little. - With a strainer, collect the juice. - In a pan, pour the juice, the sugar and the maizena. Bring to a boil and reduce the heat and stir for 5 minutes until the juice thickens. Set aside to cool down a little. - Add the strawberries to the juice and stir well. - Pour the mix on the crust and refrigerate. - In a bowl, with a hand mixer or a whisk, whip the cream with the sugar until firm. Set aside in the fridge. Before serving: Spread some whipped cream on the strawberries just before serving. 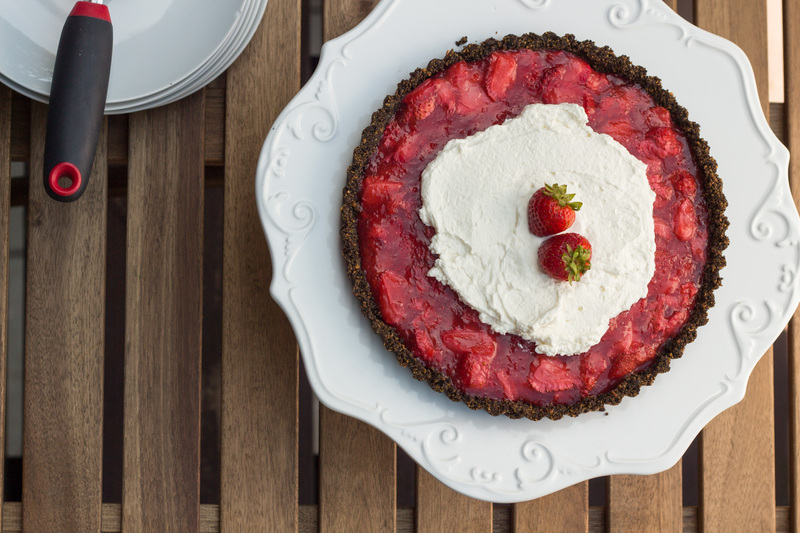 Decorate with some fresh strawberries. Wow! Oreos and strawberries? Who would have thought! Looks scrumptious!